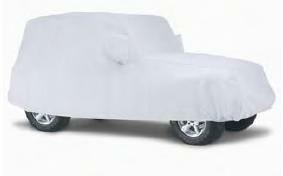 Protect your 2007-2018 JK Wrangler from harmful sunlight, dirt, airborne grit, scratches and prying eyes with a Mopar vehicle cover from JustforJeeps.com. This cover is made with Matrix material that is water resistant and breathable and can be washed. Elastic bottoms at the front and rear keep the cover tucked snugly around your Wrangler and tie-down grommets allow for additional security. A perfect fit is assured with mirror pockets and a Jeep logo finishes the look. 2-Door or 4 Door, Gray, Matrix material, license plate window, mirror pockets, with Jeep logo. Please select Wrangler model above.